Home Retro food J-E-L-L-Hell to the NO! Admit it – JELLO is slimy. Call me weird, but I just don’t like something wiggly and slippery on my tongue, even though it melts in your mouth. Just reading that makes me feel like John Hurt's character in Alien just before he met his untimely and horrifying death. Weren't his last words "I don't feel so good."? I know we’ve all seen the proliferation of vintage JELLO recipes on the many retro blogs out there – there’s a reason why people poke fun out of them. Even though JELLO was invented before the beginning of the 20th century, for some reason it enjoyed an advertising and cookbook heyday during the 50s and 60s. You just gotta wonder who came up with some of this stuff – especially JELLO salads, where unappetizing vegetable bits such as radishes and cabbage are suspended in the wiggly goop, like a science experiment gone horribly wrong. Now it’s bad enough that people combined carrots with orange flavored JELLO, or broccoli with lime. 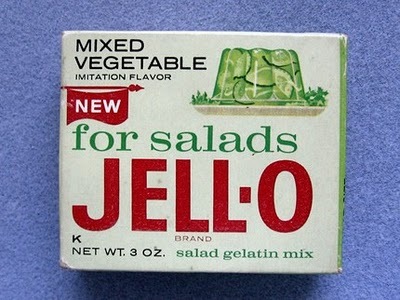 But way back in the day JELLO actually made a “mixed vegetable” flavor that was meant for the purpose of making JELLO salads with veggies. I'm guessing there's a reason why this flavor is no longer available. Did I mention that I'm not a JELLO fan? My apologies to those who are, but I couldn't hold back any longer. Please note that I actually like JELLO instant pudding, and pudding pops. 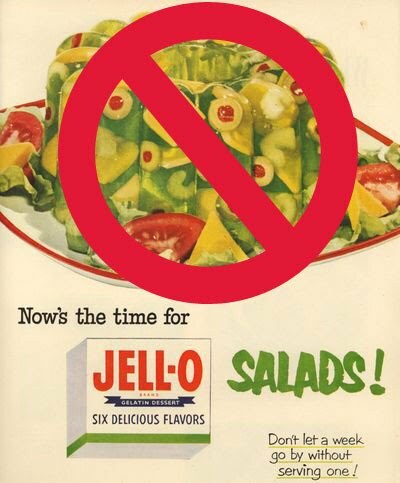 Here's a couple of vintage JELLO commercials, including a ridiculous one for JELLO Salad Week. "MMMMMM....bright, crisp vegetables in cool, shimmering JELLO: *there's* a salad for you!" There's a salad for you, alright! This Chipmunks one is cool, even with the phallic imagery....yes, I said phallic. Just look at what that rascal Alvin did to a hotdog! 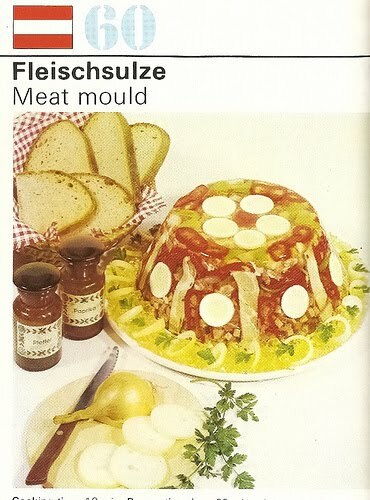 I find Jell-O salads horribly fascinating, as you know (!) but am not a huge fan of actually, you know, eating it. I used to like the Black Raspberry flavor, though. And it can't have any stuff in it or be in a weird shape. Oh, and my mom made coffee jello in the 70s - that was really good! So there's that. But otherwise I agree with you. Ack! But I like it plain anyway! Jello with carrots or celery is -not- palatable! I liked Jello 1-2-3 though but my mom wouldn't buy it often. This is truly horrifying. I agree with you on all counts. My food shouldn't still be quivering once it gets to the plate! My friends used to make fun of me in high school because I was so creeped out by the sight of Jello. They would wait for me to leave the table then put some on the table in front of me so I would freak out when I came back. I think you just convinced me to never eat this crap again! YUCK!!!! Funny post! I'm in total agreement with you. The thought of Jello gags me, really. 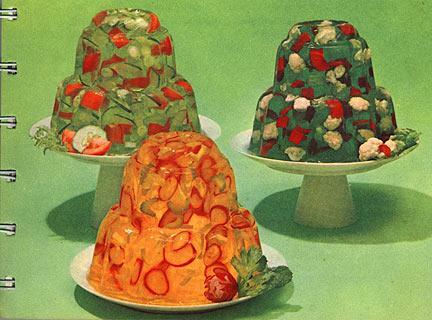 The Jello molds are truly terrifying! Still giggling! Thanks for the comments, everyone, and I'm sorry if I turned anyone off to JELLO! It's just never been one of my favorite foods. I didn't like it that much. Was there a black cherry flavour or was it just raspberry - that was okay. Jello pudding was yummy though. The molds definitely look unappetizing to me. Vegtables in jello - yuck. I am a vegetarian who thought Jello was OK until I heard the "horse hooves" comment some years ago and then had to give it up. I do believe they make a veggie friendly version now, but I prefer when other people prepare my food, even Jello (I'm a bad food prepareer), so I haven't had it for some time. I LOVED Ambrosia, which was pink, therefore it ruled and I do believe part of the makeup of it was Jello. I'd have to double check though. I didn't realize how silly Ambrosia was until Kathy Baker's character brings it to the BBQ in Edward Scissorhands! I like Jello, not with veggies though. I am a total texture eater and it passes my test. What I miss are Jello pudding pops! Not only horse hoofs, Amanda, but bone and collagen of all sorts of animals! Oh dear, ambrosia is another dessert I could never quite stomach. YES! I finally read this! It's okay that you think Jell-O is yucky. Everyone has different likes and dis-likes and quite frankly, I'm not exactly known for a sophisticated pallet. I like a lot of weird foods (such as seaweed soup) that most people wouldn't touch. That being said, I'm never being sarcastic when I say something like, "That Veggie Trio loaf was actually quite tasty!" But don't worry, I understand that not everyone would enjoy a Veggie Trio Jell-O Loaf. However, that won't stop me from trying it, and I hope other people will too. Cheers to you and I'm glad you enjoy my blog, even if you don't enjoy Jell-O! Hi Theresa! Happy to hear from you and glad to know you weren't offended by my post! I have to say your blog is very cool and a great resource for the JELLO fans. Thanks for stopping by! Another Jell-O ad I saw exactly once was for a new tart-flavored line - it spoofed "Arsenic and Old Lace" where a gentleman was visiting two genteel old ladies who gave him some of the stuff...and his reaction was that he thought he was poisoned! Not the best way to sell your product.